You'll be £11.99 closer to your next £10.00 credit when you purchase The Dunkirk Perimeter and Evacuation 1940. What's this? The book, the latest in a series of eight Battleground Europe books that deals with the BEF's campaign in France and Flanders in 1940, covers the fierce fighting around the Dunkerque Perimeter during May and June 1940 between the retreating British Expeditionary Force and its French allies and the advancing German army. It covers the area that most people in Britain associate with the fighting in France in 1940, a military disaster that could have been much worse. This grievous military setback was soon transformed into a morale boosting symbol of the resilience of the British against a Germany that had crushed so many nations in a matter of weeks. With over 200 black and white photographs and fourteen maps, this book looks in some detail at the units deployed around Dunkerque and Nieuport and their often desperate actions to prevent the inevitable advance of German forces opposing them. 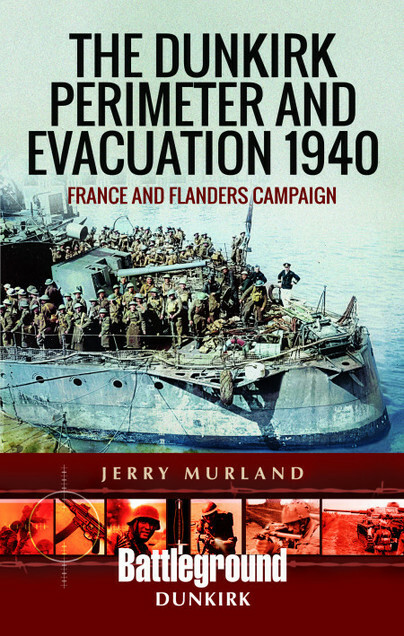 The evacuation of the BEF from the beaches east of Dunkerque is covered in detail from the perspective of the Royal Navy and from the standpoint of the soldier on the beaches. Unusual for a Battleground Europe publication is the inclusion of a walk and drive around Ramsgate and Dover, covering the English end of the evacuation. In addition to visits to the relevant cemeteries, the book includes three appendices and two car tours, one tour covering the whole of the Dunkirk perimeter and the other covering Ramsgate and Dover, although there is plenty of scope for walking in both tours. There is also a walk around De Panne, which takes the tourist along the beach that saw so much of the evacuation, and into the back areas of the town where the Germans left their mark when clearing up after the British had gone.